It never takes me long to figure out my own way of integrating or modifying things to better suit my specific needs, and the recent Photon light purchase is no exception. Took apart one of the swivel-mount clips which came with the light, drilled a few tiny slots to accept zip-ties, and used a hunk of taillight mount rubber shim for a non-slip base. A little filing and shaping the underside and fashioning the zip ties just-so, and there you go: a perfectly-aimed night vision map light for future night rides. The quick-release feature remains intact, so battery swaps or swapping out the whole light to change colors is a snap. The existing Blackburn Flea 1.0 white headlight is at left, aimed higher to get driver's attentions and to light up reflective roadsigns for navigation. The helmet is road-ready! The old rail depot at Parker, KS., heading back north after pre-riding a section of a new 200km route I'll be submitting in early 2015. Oh, yes... it's bigger, badder, and scenically wonderful! Can't wait to ride the whole thing! Hey, randonneurs: the old Photon squeeze light has grown up; not in size, but in features. $15 is a lot for a tiny, U.S. quarter-sized flashlight, perhaps, but these are far and away superior to those dollar-bin lights that pop up from time to time. Waterproof, USA-made, replaceable battery, 12 colors to pick from, constant on, squeeze on/off, fully variable brightness, multiple flash modes. Comes with a magnetic swivel-head clip and lanyard. For reading cue sheets on long night rides, fixing a flat, checking roadsigns, or standing in as a backup taillight, these definitely aren't throwaway lights. Small enough to stash and forget in a seatbag, get ready for the 2015 brevets and grab one! December skies: the southwest winds create wild streaking effects in the skies above Spring Hill, KS., painting an alien vista from a faraway world as the sun struggles to punch through. Winds this day gusted to over 40mph, turning my impromptu run at the Old KC Road 100k into a dichotomy of work and reward. First, leg-searing headwind work yields a whopping 9mph average, then turning north uncorks an average of 31mph. An awesome ride, and enjoying 50°F+ temps in December was the icing. If it hadn't been so foggy and misty, this might have turned out better. Long steady climbs heading toward Everest, MO. along highway "W" during yesterday's ride. The fuzzy blips are Steven W., Paul T. and new rider Robin. She hadn't ridden in two months, but coulda fooled us: this would be one of the last times I'd see her or Paul that day, both fast and strong. Glen returns the favor after I take his photo, and gets me climbing up onto the highlands of Amarugia... which is fun to say because it sounds downright Middle Earth or something. All the better with the weather, which was downright Scottish; thus completing the illusion. Great day, great weather (no really! ), and great scenery. Surprisingly, I don't have much to report after this one - not sure what that means, aside from I shouldn't have waited so long to come back. Today, no real pains, no adjustments needed. No more excuses, apparently I still got it. Light fading, the last dozen miles back toward Martin City take place on this old road which runs behind what used to be Richards-Gebaur AFB, now a giant KCS intermodal facility. Here, right before arriving at the railroad overpass, a switching engine (probably an EMD SW1500 or a MP15AC) crosses over while shuffling containers. The sky begins to get all purplish as the suns light fades, and our headlamps come on. The cap of a great day in the saddle. Glen R. and I approaching the Amarugia Highlands at mile 50 on today's 202km (125 mile) timed tour. It shouldn't be a mystery at this point that the whole "Milepost 1445" thing is really just a cheat code for me, in the hopes that I can bring more consistent posting, more consistent content across platforms, and more exposure to the joys of commuting and randonneuring to a larger audience. The cross-pollination started with Facebook, then Twitter, and now the ever-popular Instagram service. You can choose to follow me on one, a couple, all, or - yes - none. I really do hope, however, you'll stick around. Big goals - but no big announcements. Not until I'm trained, registered, and possibly standing at the start line. No false drama, no huge promises to myself or anyone else. I'm done with that malarkey. Vacation! Vacation! Finally, vacation from work is here! The annual hiatus! Wheeeew, what a rough, busy, hectic, stressful year. I wish I'd taken some photos with a bit more foresight to prove this, but, I've noticed a LOT more grey hair infiltrating my Scottish-red goatee lately. Age and stress, anyone? Ugh. Best combatant, though, remains a good diet and regular exercise. Lately, I've done neither. Crap, I can't even think straight. I just tried to spell "neither" with a "gh". I don't think that's olde English, is it? Made-up ye olde English, perhaps... "neighthour, my liege!" Yeah, yeah... it's all about the social media. (and the "bass", apparently) I think I like the way things are progressing in that realm - but, I'd really like to see more growth. I don't think, however, I have the time to devote toward that. Too many other things I should be doing, and I refuse... reFUSE... to stoop to the plaguesourcing techniques of some of the "get more likes! Click here!" crowd. I don't know if this multiplatforming I'm doing is the solution either, because I can't seem to get the if-this-then-(do five things) Rube Goldberg sorta routine nailed to prevent duplicate posts and general confusion from happening. I need to get back to class at Google University and study up. The only thing I can think of worse than bot-followers are noobs (like me) that don't know what they are doing when they suddenly blast out five of the same post. I feel like that guy right about now, but I'm working on it. Maybe none of this matters... I mean, I don't NEEED a zillion followers; yet, at the same time I am watching a lot more YouTube shorts lately which convince me I can do a lot better than I have been. If more hits = more riders, then my motivation checkpoint remains valid thus far. A December from the past, you know - back when I rode a bike. Finally breaking the ice in grand style this coming weekend, fresh on vacation, fresh from a return to the gym, weights, cardio ... and chock full of carbs from a still-crappy diet, THIS dude is headed outdoors, ya know. My old lady, she's kinda funny and all about it. The other day, I was leaning up against a lightpost and she had the nerve to tell me that she didn't believe I was even looking for a job - can you believe that? Geez, lady. About that time, my mouth was getting pretty dry, so I rode down to my local bar - you know, people. George Throughgood (hey, look a "gh"!) had no idea he'd actually composed the makings of a pretty good EDM remix. More to come on that front. Yeah, so, 200km ride on Sunday. Archie Bunker route. Hey, that's the LAST route I rode, six months ago. Nice! Almost literally picking it up right where I left off. I'm sure to have some interesting posts coming from that activity, so stay tuned. Later on, you half-crazed screaming teenage fans! Chain-L gets a shot for winter duty: Okay I'll bite. After reading all the interesting reviews, decided to make a totally unprompted purchase. I've been a ProGold ProLink user for 12 years with no complaints, but I'll try anything for 1,000 miles. The way I go though chains, that's nearly one application per chain! I'll report back - but, I have a feeling this sort of lube only rewards me and my fellow graduates from the OCD-U school for bicycle drivetrain cleaners. The Firehouse: station #2 for Johnson county's expanded "northwest consolidated fire district", which serves most of Lexington township while also being contracted for nearby Sunflower Army Ammunition plant. Located at 127th and Gardner Rd., with a newer garage building standing a few yards south. It is difficult to age this building, but one could imagine it has been part of the landscape here for quite some time. Behind the camera stands an old farmstead, perhaps quarters for early fire volunteers. While 127th crumbles into a minimum maintenance road if one heads east from here, and Gardner road is largely a dead end to the north, traffic still passes at a slow, yet consistent rate. Cut off from nearly every major throughway, a vague zigzag of backroads are the only passage between Gardner, Eudora and Desoto. Today's tour retraces an old DSR route, loaded with treasures like this one all along the way. West-Central JoCo: heading out toward Clearview City, KS., this is Moonlight Rd. heading north. I often head either south or north of town, but this time I headed west instead, past the rock quarries and aggregate plants, past the rail corridors, past the US highways that divide the county in two, and past the airport into that forgotten part of Johnson county where old rural flavor, horse ranches and an abandoned ammunition plant meet. Only recently have the opulent raised their dream homes, but most of the area remains as it had for decades: quiet, unassuming Kansas life. The counties biggest hills live here near Olathe lake, and the Kansas Prairie visitors center sits right between them at Cedar Niles road. Today, keen on scenery and blowing the dust out of the climbing legs, I cover them all under chilly, cloudy skies. December cycling, prairie-style. More metalwork: Front rack headlight bracket mark-2, before the final polish. I guess I can already see the reflections from the shop lights... maybe that's good enough for this morning, considering I now need to make three more just like it for a potential dual headlight setup. This is in AL instead of steel, so it's lighter (which doesn't matter) and the knurled locknuts will bite better when mounted (which does) - especially with the M5 drillings instead of borrowing the giant chainring bolt holes like I had on the mark 1 version. Plus, this puts the light 1cm down and forward from the current position, making it impossible for the front bag to make contact with it. Barely an issue with the existing setup, so today's work is mainly for catharsis after a hectic week. It's a small step closer to possibly offering these for sale if the interest continues... but, yeah: you can make your own easily, too. I've got riding to do, so I'll not 'waste' any more of today's rare December weather in the shop. Always feels good to get my hands busy on something other than a keyboard, though, I'd rather get the bike dirty instead. Flashing back to Knob Noster, February 2014, mile 115, Terry pulling the train. Those who know cycling understand the feelings of a great ride don't come from the bike, the road, or the effort, but from the spirit the bike extracts from its rider. It's difficult to describe what it feels like to the uninitiated though I've attempted to over the years, clearly paying little mind to just how long it takes. A man of few words, I am not. Starting back in 2002, commuterDude focused on commuting by bicycle, then began to migrate toward long distance cycling, all while highlighting many of my personal highs and lows along the way. I have overcome obstacles, cracked under my own pressure, emerged victorious - and then repeated. Even though these pages have often served as confidant and sounding board, in truth the blog wasn't ever intended to be about me. As they say, it is what it is; and so herein lay the chronicles of an everyman who found himself while floating along atop a bicycle. Interspersed, however, hide the ride reports about which I'm most proud: rare moments when the ride took focus and the story developed effortlessly. The goal now involves a reinvention of sorts to attempt the same sort of flavor you've come to expect from those posts, but in a much smaller space and with more consistency. For the first time in almost a decade, the Kogs gets something of a make-over - at least as far as the front end is concerned. I've been sitting on a GB25 handlebar (front) bag for a while now, and I finally decided to give mounting it a shot. Why the hesitation? Well, that's me thinking too much - as is often the case. I'm not the milli-metric nut-job I once was - but, I still appreciate precision and bespoke touches. Centering and accuracy are simply part of the landscape here, so the activity remains therapeutically perfect for me... but, for a while I struggled with changing anything at all. All I knew was, after almost a year riding with them, that bags mounted directly to the handlebars wasn't quite cutting the mustard. SO, let's begin; I don't have much footage of fabbing-up the front rack and decaleur setup, unfortunately. During the build, it completely slipped my mind! I will, later, post some photos to social media with some of the finer touches. It's sloppy, not exactly straight, and uses P-clamps to hold it onto the front fork legs. Wrapping up the photo series on fabricating headlight brackets out of old chainrings, the final product mounted and wired up. I ended up with two mirror image brackets after discovering that supporting the light from only one side invited an annoying lateral wobble. Doubling up provided the necessary bracing, and the wobble is gone, resulting in a solid headlight beam. The biggest trick was getting the light high enough to avoid too much tire shadowing and for it to be visible from the rider's left in traffic, but to still keep it low enough that the bag wouldn't block the beam or put pressure on the mount or light itself. So far, so good. I don't prefer adding a lot of complication to the bike, and this project became tough to stomach at times, adding complication and weight... But, like fenders, once mounted and forgotten, the usefulness of the front bag should quickly outweigh any previous concerns. Now, to get out out on the road to expose and fix any rattles, and we're ready for the 2015 brevet season, and the next R-12/P-12 streak! We are deep into Fall here, and the sun isn't out as much, obviously, leaving the sky far darker each morning and evening, thus making it harder to spot both motorcyclists and diehard bicyclists. This is an example of how reflective tape can help. The tape on the wheels is most effective, as it creates the image of a full disc once the bike is in motion, and also helps indicate a riders relative speed. Even if you don't want to wear the admittedly dorky reflective vest, applying reflective tape to the bike ensures you are visible to some degree, no matter what the of day you ride. Digging out, but not like you think. The first snowfall of the new season came a little early yesterday, capping off - for me - a long, arduous year. A roller-coaster of a year. A year of further self-discovery. I won't get into too much of that here, but, after a month or two of sitting down and thinking - calmly - I have emerged renewed, rested, and ... no, no... not ready. That, for me, is probably okay. For now. I believe, for me personally, coming off a good streak of a few years' worth of R-12 rides perhaps warranted some rest, even with the difficulty of letting that streak go in July. With my shoulder repaired and healed, I started with good intentions to get right back on the proverbial horse; yet, I have not returned to the bike in earnest, nor have I kept my own promises about maintaining fitness and rising above the challenge of restricted activity. This is my personal struggle, not-so-personally outlined ad naseum throughout this blog's past. Even having run a half-marathon (er, jogged/walked) back in late July, I'd have thought myself motivated. It didn't last. So, knowing how I deal with personal stress, upheavals in the office, and the financial balancing-act that comes with teenagers in the house - here I am, another blank - blank, yes, but not white and clean; more tattered and beige - canvas on which to paint my next portrait. These are tales best left untold, at least unrecounted. 175th and Woodland, my favorite old store that hasn't been open the whole time I've known about it. Bonita Flats, KS. Construction nearby and other rustling around the property, I'm not sure this will be here in a few months time. Had to get one more pic. Mileage? Uhhh... Since July's shoulder surgery (non bike related) I have not only not ridden much, I have become catastrophically lazy on the matter of mileage logging. I have the numbers... Somewhere.... Just not logged against equipment. However, today marks the first "natural" flat I've experienced with the GB Cerf 700x28mm road tires. By "natural", I mean a flat caused by something run over in the natural course of riding. I did endure a front blow-out pinch flat back in... I'll look... Yet, that was caused by the rider being a little foolish. I suppose it still presented a good test, but it certainly wasn't a normal puncture. Today's, by contrast, occurred "naturally", wherein I noticed the loss of air pressure after a few wallowy-feeling corners, as the rear tire's pressure dropped below safe riding levels. I stopped, examined the tire, found nothing on first glance... So, I aired it up and rode it the last ten miles to home. So far this evening I haven't made the time to change it out and examine things - I may wait until the morning - but, I'll report back with mileage, tread status, and thoughts. Maybe a photo if warranted. I'm impressed, since I've crossed the mileage when I'd normally have swapped out the Panaracer Pasela TG (now PT) tires... Yet, I still wonder about buying a pair of Pasela non - flat - protected tires, for a direct comparison. Their price is hard to ignore compared to the "boutique-ish" GBs. We shall see. Stay tuned as I wrap up this long term test with this latest flat report. Yea! The realization that October is practically half over, it occurs to me that I should be back in the saddle, that PT should be over (it is), and that I am way, way behind in my plans and "training." Last week, I hammered hard on the commute home, chasing down a couple of faster gents, finding my limits. At my favorite hill, near 106th and Foster on the bike trail, I nearly passed out from the anaerobic effort of catching up to (within a few yards.. But out of overtaking reach) the rider I'd been chasing. Only a few months before, I'd sat comfortably at the top of the Map my Ride standings at 46 seconds from the climb to the sound wall separating the trail from I-435. I'm outta shape. Solution? Get to work. Literally. Oh, who am I kidding? It's only once a month, and I love writing. But, new goal... 1445 Words or Less. That'll work. For now. Breaking the radio silence after a couple months away from the creative side of my keyboard, I find myself with very little to say on the subject of riding. In large part, it comes from not really having ridden much. What I have found interesting is the amount of free time I've seemed to already occupy in the wake of normally spending a few hours per weekend typing, proofing and cleaning up photos. I've gotten a lot more done by not being strapped to the keyboard constantly, and that's a good thing. Sure, much of it stemmed from a self-imposed need to post detailed ride reports to share the magic with the interwebs. For myself, writing served to outline the mental journey involved with riding such distances, plus the therapeutic breakouts I'd often find along my way. I don't mean to imply that I suddenly don't need the riding anymore - I don't need the writing 5,000+ words part, as I'd become accustomed to doing. Guest post! The Nebraska 400k - by Glen R.
The Nebraska 400k . . . This is one of the most simple routes to follow: a cue sheet really isn't needed; yet, at the same time it is the hardest ride I have completed yet. The route starts and ends in the same Nebraska town of Falls City. Look on a map near the bottom right hand point of Nebraska move slightly to the East just above the Kansas border and you'll find it. The route heads due west using primarily highway 8. Ten riders started the trip, Spencer, Rodney G., Gary, Greg C., Joshua, Ron A., Jack, David M., Rod H. And Me. Nine finished: Rod H. from Omaha had a pedal problem shortly after we started the ride, and turned back. Check point #2 is in Pawnee city. Two of America's greatest heroes were born here: Larry the cable guy and of course Me! It had been a really good ride so far, with a cold start about 34°, little to no wind! ...But, dark with fog mixed in. The group stayed together up to this point a little chit chat about previous rides and what was new with each other. From A to Z, Everything In Between, and Whatever Lay Beyond. They call the route "The Hell of the North", a partial homage to the legendary Paris-Roubaix race in northern France held each April, yes, somehow still apt for the generally north-south oriented Liberty-to-Albany, MO. 300k of KCUC fame. Infamous, perhaps? I love this route, and I really - sincerely - hope that Bob brings it back for 2015, as preparation for P-B-P. Selfishly, I must admit... with most folks satisfied sticking to 200k for their monthly rides (me included, if I'm honest), it's really, really difficult to ride this route as a permanent unless one enjoys being alone. Finding anyone to accompany me on this route has proved difficult in the past . . . and, it's proved difficult for me to attempt it on my own. Mental, nothing more. It's a route map and profile that can creep into one's head, if allowed, and it's aptly-named. So, too, is the Ride with the Devil 200k permanent route - which passes this same intersection from the opposite direction. It's a different slice of "hell." Tasty... but tough. As human interest stories go, randonneuring must reside high on the list of leisure activities overflowing with metaphors on the endurance of the human body and spirit, and the rewards of "reaching." A regional newspaper recently caught up with KCUC member Joe Edwards for just such a story, talking about our sport and its unique challenges. Read the article here. Congrats, Joe! Granted, I have plenty to occupy me - but, boredom when it comes to the bike. I think this is what got me into trouble with the "fit phase" where I had problems. Hide the tools... the dude is bored. It's been an interesting 24-hours in the stable, all on the same bike - the Kogs. Boredom first led me down a pathway which began with a dream of riding single-speed again, as I'd done successfully for several years about a decade ago. Alas, the vertical dropouts on the Kogs presented obvious problems - but, after finding a photo online with a 'magic gear' (a combination of cog and chainring which creates perfect chain tension on a bicycle with vertical dropouts, and ideal without the use of a half-link). After some tinkering, I found that gear - and, miracle of miracles, it happened to provide the exact same gear-inch result as my "old standby", the 42x17 (about 66") combination. I'd successfully slayed Bob's old Liberty route and the Appleton City 400k on that ratio, without any major issues recorded. In fact, I ended up catching and passing people. It was magic time again! July from the pit lane, what-the-heck is "rundonneuring", and gears... who needs 'em? It happens to me at least once a year. The need... for speed. "Talk to me, Goose." Shortly after that, I find myself in the garage, starting silently at my bike and some of the old frames ​resting in the storage room. Blast. Stuff that hangs from my bike suddenly looks out of place, heavy, as aero as a​ fallen​ log, bulky as a bag of leaves. Why does this happen? Why is the bike the first place I look for speed? I think we all do this, as cyclists, once in a while. For me, the goal is to get out of the garage before I get the tools in my hands. At the worst of times I had managed three complete bike builds in one weekend, the last one being the re-rebuild of the bike I'd started with. See, I​ eventually listen​ed​ to reason... b​ut only after swapping parts across three frames. Exhausting... and time better spent riding, instead of thinking and lamenting. That's what SHE said. huuhuhuhuhhuhuhhhhuhuhuh. Spring is here! Spring is here! Life is Skittles and life is beer! Riding. Apologies to Tom Lehrer. While I love nature, I have the unfortunate distinction of not really being able to able to nurture and control it the way - say - a professional landscaper or gardener. Animals are one thing... plants and I sometimes have a misunderstanding. Still, I have a few hearty flora here and there courtesy my home's old residents and the magic of deep bulbs and perennial growth patterns. 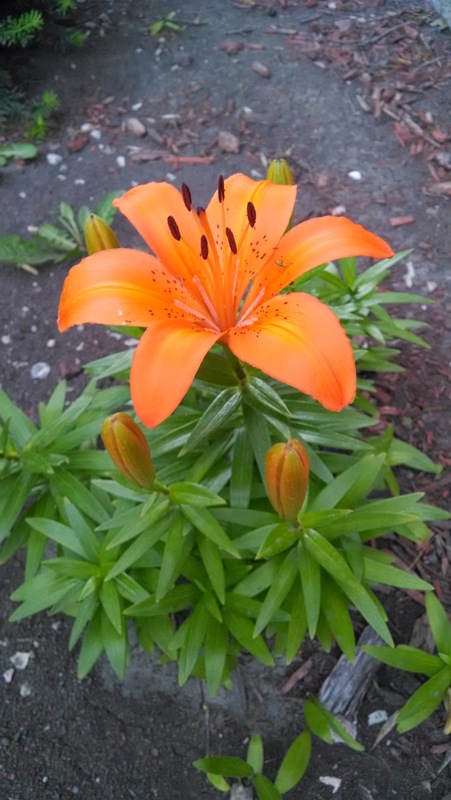 When this beauty blooms, I know the good weather is finally here to stay. ​It is with particular sadness I write to report the loss of one of our own, Mr. Mark Jilka, a long-time participant with our randonneuring group. Mark had been riding southbound on the shoulder of K-177, approximately 3 miles south of Manhattan, KS., when a vehicle - also travelling south - presumably left the lane and struck him from behind. The internet news links below contain details - I take no pleasure in posting this information, however, we felt compelled to inform the cycling public and our members as soon as possible. Please take a few moments to remember Mark. Our thoughts and condolences go out to his family and friends during this difficult time. The battle-cry of those recently released from their daily penance inside the confines of the office. Whatterya doin' after work? Mowin' the grass? Hittin' the batting cages? Dinner with the family? It's one of those questions I'd used to answer the same way each time; when I'd be asked several years back what my plans were: "I'm goin' on a bike ride." Well, where to begin . . . If you read this post back in mid-March, you might remember that I wasn't prepared to make any gigantic claims or "OMG THIS PHONE IS AMAZING!" proclamations; but, my initial impressions had been very positive with regards to Compass Bicycle's 'Grand Bois' tires: essentially, a great idea realized, and produced for them by the experts at Panaracer in Japan. The idea? Well, it's nothing new - that's for certain: I can remember tire manufacturers claiming their triumph over this goal since the first time I opened Bicycling Magazine many years back: a tire with the convenience of a clincher and the ride of a tubular! Pah. Many a non-believer was born as a result of such bold claims and subsequent let-downs. Try as they may have, either technology or manufacturing or the need for features which would satisfy the bulk of customers (like flat-protection) would ruin the ride quality, or speed, or handling - or all three. Back to square one. It seemed all along that someone not-so-keen on marketing, bottom-line and gimmickry needed to come along and attack this goal; yet, therein lay some trepidation, too - which I'll cover toward the end. A quick addendum to the Aliceville Twister ride, I wasn't fast enough - nor do I have the right camera - to catch a decent shot of one of these little guys, so I went out and grabbed an open-license stock photo from the web instead. Upon entering the Flint Hills area, we started to see a LOT of these guys flitting about, hard at work searching out the day's catch. Fun to watch, colorful, clever, smart, and sorta curious about us... from a safe distance, of course. 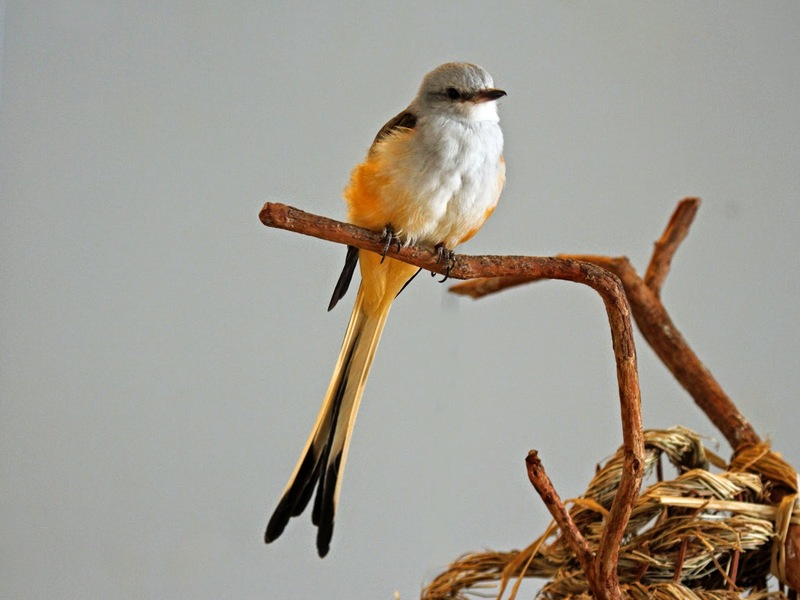 The Scissor-Tailed Flycatcher is normally found a bit further south of here, but, we are indeed right on the northern fringes of their normal territory - and the hunting was good the day we rode. Along with the usual aviary fare of red-winged blackbirds, Meadowlarks, barn swallows, and buntings, I found this character to be the most entertaining of the day. The Aliceville Twister - The May 200K! The only sound came from the roar of the constant prairie winds in my ears, punctuated occasionally by the rush of a passing car or truck. Peering out from under the lip of my helmet, the road continued to stretch toward the unbroken horizon ahead of me. Steven was still a tiny yellowish blip on the radar... barely. For a few milliseconds I thought to myself, this must be what the Last Chance 1200km ride feels like. I'm immediately aware of how much more tired I'd likely be, had it really been that event unfolding under my wheels. Another swig of water, and the pedaling continued for what seemed like hours. I felt like I'd never reach the highway crossing. This IS only 200-some kilometers, right? Had I made a horrible mathematics error? I don't remember any of this. Where's Josh? Where am *I*?? Aliceville Twister , May complete! One more month before this latest R-12 is in the books, so I'm pretty excited. Warm weather is here finally; yet, it's not unbearably hot, and commutes are happening as often as the schedule will allow. Happy. the May installment of the R-12 permanent unwrapped a new route, debuting The Aliceville Twister - a 206km jaunt out into the Flint Hills region of east-central KS, starting in Garnett, KS. and returning along the Prairie Spirit Rail Trail. That last part, especially, possibly the most fun I've had at the end of a 200k ride... but, as I'd been warned, it's also a great way to make it a squeeze to make the last time cut-off. Throw in 30 MPH winds (yes, 30 sustained at one point, not just gusts) and you have a tough - but rewarding - day in the saddle. We finished with a scant 22 minutes remaining, a combination of 12+ hours of battle with the relentless plains winds, some hills, a bridge under construction, a couple wrong turns, and longer-than-normal rests at the controls to recover from it all. Great route - but bring your steel nerves and patience! More to come as I construct the usual ride report! It's nice outside... get out there! Will Cynicism Kill the Pastime? Coffee poured, the Android device open to my feed reader - Saturday mornings in the easy chair, watching the sun slowly illuminate the front room while I dream of faraway roads and endless miles of joy. These are how the non-riding weekend mornings are spent. Before I mow the grass or start the laundry, a few encouraging words from the annals of cycling blog and newsletter fill my brain with delights. Bicycle to Iowa? No problem! my head ... even though it had indeed been there, and had played a large part in our finishing pace. I was bummed that we seemed to have dodged every thunderstorm; yet, still elated to have enjoyed their light-show from a safer distance. Mainly, however, I had been a bit sad the event was NOT a 600km. Granted, the feeling didn't originate from a lack of challenge over the previous 24-hours. Sore, yes. Probably in need of a short nap and a good Perkins refueling, but, a sense of being a little bummed-out washed across me while I hoisted my bike onto the roof rack for the journey home. Something akin to "that's all?" It's another finish, another March, another one in the books! It never gets old, somehow; however, I keep finding less and less to come to the keyboard with as this year unfolds. I'm definitely going to stick to the photo-post idea, however... each ride does deserve its mention - but, I don't know if I need to dedicate as much time to it as I used to; especially on repeating routes. I feel a finality approaching, something akin to a new frontier opening while many chapters of struggle close. Not really sure what that's about - where it's coming from - but, it's great. It's almost as if I've said all that needs to be said, I'd rather be riding than writing about it, maybe. What I'm feeling borders on feeling personally complete. Maybe after all these miles, at last I feel as if I've found what I've been looking for. Just in the last six or seven rides, and with the difficulty of the last year in general... There is a feeling that Del G. best submitted in the last few miles of this ride: "(after all we'd been through last March, with the snow), what can't I do now? I can do ANYTHING!" This shouldn't be confused with a sudden, brash profession of superiority or cockiness...it is, instead, a long-absent feeling of self-worth, confidence, and empowerment. Invincible? No. Hardly. This feeling reminds me of how I felt after the 600k in '07... it's a natural "high" that one can ride for months afterward. One critical photo I'd indvertantly excluded from the 100km Ride Report.... my choice of jersey for the ride that day: As the layers came off with the rising temperature, nothing could have prepared my riding counterparts for the sheer terror which awaited their retinas. Pure, unadulterated, unfettered 1980's Italian glory, in original Spandex. Size, XL... you know, for the Italians that are in the clydesdale-class of 120lbs. LOL. Euro-sizing makes me sick. Behold. Best $10 I ever spent. Diggity-dank threads... is that your wife's jersey, Nancy? ...the 300k cometh.... stay thirsty. Well, you'd been warned -- "this blog is about to get a LOT more boring." That's sorta happened of late. I've largely hung out a shingle here strung from the pegs of struggle, hardship, personal discovery, and self-loathing. A lot of that has none-too-soon become water under the proverbial bridge. Still, there remains much to share -- so, it's far likelier these pages will continue to amass, as opposed to the alternative. Yet, sometimes I have trouble telling the GOOD story, as opposed to "whatever horrible thing" might have happened on the last ride. The old saying goes "hope for the best, but prepare for the worst," So turns over my entire outlook on life... previously prepared for the worst and fully expecting it, I'm now focused on being prepared for the worst, but enjoying the NOW. To wit - this last ride went SO well, I'd nearly forgotten I'd participated in it until I stumbled over the photos I'd taken with the camera that day. So, a quick post is definitely in order here -- to capture the essence of the great memories this ride produced --- sure, maybe they won't make for riveting commentary - but, hey, we can give it a shot. I'm so excited for the 300k next week. Yeah, I miss the old Albany route, but this Oak Grove ride is an instant classic; I think this is the third year for it now. So...new goal is to make it back to the McD's at Higginsville, MO before sundown...or at least before they close! Need shake! Need fries! I wanted to invite all our new riders off the fence and out to our 300km on the 12th. There is something about this route... A classic, somehow. Hills, but not too many. Long, uninterrupted stretches to extend your thoughts and enjoyment. A major river crossing of the muddy Missouri at Glasgow. A chance to see the sunrise AND the sunset from the saddle ... Or, a chance to try and beat the sunset, for the spirited. You've got the 200 licked... What's another 100k, right? It's a great milestone, a full day of adventure, and a great test. Hope to see you there! Oooo, you're all in, now, aren't ya?? "...but with the blast-shield down I can't see! How am I supposed to ride?" While I do indeed have two ride reports in the hopper at the moment, one each for the recent 100 and 200k KCUC events, therein lay the problem: I'm getting backed up. Life is nuts, and I have finally figured out how to relax a little.... Which, in large part, involves not camping out in front of the computer until all hours. Photos take care of themselves, and the ride reports will continue - but, they may involve captions and quick hits. I've mentioned this in the past, and then immediately drop a 7,000 epic post on everyone... So, yeah; some rides will garner more than others. I've also developed two rides for the RUSA catalog needing pre-riding.... And I can't do that if I'm sitting and typing. After last year, however, well ... How do I say this without it sounding like finality: I have sorted out more, mentally, in the last 18 months than in years otherwise. A lot of that unfolded in the saddle. The last year in particular threw challenges at all of us, weather alone. It changed me a little. Even the recent high winds typical of spring are met with "hmm, that's not so bad." My personal journey toward just being able to shut-up and ride feels largely complete...at least, very close to something resembling a complete transformation back to a place where I love riding more, and want to do more. Maybe burnout lasts longer than I thought, but it's gone now. I suppose I finally grew tired of hearing the constant string of beefin' from myself, so, there you have it. So, I'll knock out these next two photo-posts, and get back to riding. I suggest you do the same, because it's great out there! Commuter Season - can you see me now? That means commuter season is upon us...! Either shop has a great selection of racks, bags, front & rear lights, locks, clothing, and knowledge to help make your commuting experience a success. Check them out! This episode: reflectivity and safety. I'm filing this under "do better research." I'd made some assumptions in the post below, and this comment (immediately below) from "PB" corrects those assumptions. Compass Tires and Grand Bois tires are distinct from one another - the Compass-branded tires are NOT, as I'd indicated in error, a replacement of Grand Bois. Grand Bois tires are still made and sold. I'd also blended Compass and Boulder Bicycle together in some early sentences - they are also distinct entities, which happen to nicely complement each other. My apologies to the companies referenced, and to my readers for the confusion. No miss-information had been intended! I learned quite a bit about both Compass, Boulder Bicycle, and Grand Bois after receiving this comment, and I remain grateful for "PB" having taken the time to set me straight. Hi Keith, nice write-up! You've got a few details smushed together. No harm done, but it may be helpful to your readers to sort it out. Executive Summary: Compass tires did not replace Grand Bois, they are a new/different line of tires. Jan Heine at Compass sells tires and other parts, but doesn't sell frames. Mike Kone at Boulder Bicycle sells Boulder & Rene Herse frames, and also sells parts. The Compass tires are a new line spec'd by Jan Heine, who owns Compass Bicycles and publishes Bicycle Quarterly. They do not replace theGrand Bois tires, which are still being produced, and Jan still carries Grand Bois. His Compass tires have some modified designs and improvements, best to get the details from his site. The Boulder and Rene Herse frames are spec'd and sold by Mike Kone, at Boulder Bicycle in CO, not by Jan. The Boulder frames are built to Mike's specs by Waterford, the Rene Herse are custom-built for Mike by Mark Nobilette. Mike does also carry both Compass and Grand Bois tires, along with a bunch of other components. We are in a Golden Era of awesome hardware made for unracers. Lots of steel frames designed for wider tire clearance, for fast but comfy riding. Lots of incredibly awesome lightweight and supple wide tires. Wider rims, wider gearing, great saddles, racks, bags--I could go on and on. But I'll spare you. ANY reference to Compass Bicycles actually "making" the Grand Bois tires is incorrect; so please forgive me if any untouched passages re-state that impression. I have re-worded and crossed out many things to show the original notion, and the truth. Some passages have been removed entirely, as they no longer offered relevance to the review of the tires themselves. Welp, I drank the kool-aid and bit the bullet on a set of tires offered by Compass Bicycles, purveyors of fine cycling goods and Bicycle Quarterly magazine. In possibly BQ's most-read and referred-to article series, they tackled putting to rest all the conjecture, tribal-knowledge, and wives'-tales about the rolling resistance of bicycle tires, all things considered: width, volume, air-pressure, contact patch size, tread composition, casing, construction. Exhaustive research revealed interesting results, well worth the read. The culmination of that research, spanning eight years of data-gathering and testing, has yielded the Grand Bois line of tires, now simply sold as "Compass" tires. These, however, are not the tires I'm reviewing. The Grand Bois tires are available from Compass Bicycles, but are produced by a different company and are imported and sold by Compass Bicycles. The tires I'm posting about here, specifically, are produced/commisioned by Cycles Grand Bois, and have the model name of "Cerf." I wonder how much of the name change had to do with the I'm not really sure how to pronounce this name, as I imagine it would be sometimes comical to answer the phone at Compass and struggle with all the variations of the "Grand boys" vs. "Grand bwaa" pronunciation conundrum. ...and that's only taking the 2nd word into consideration. Gran? Grand? Grawn? They're Compass tires now. Problem solved. Nope! Grand Bois tires are still being made, and they are sold by Compass Bicycles. The Compass-brand tires are different, and are the real culmination of BQ's research.